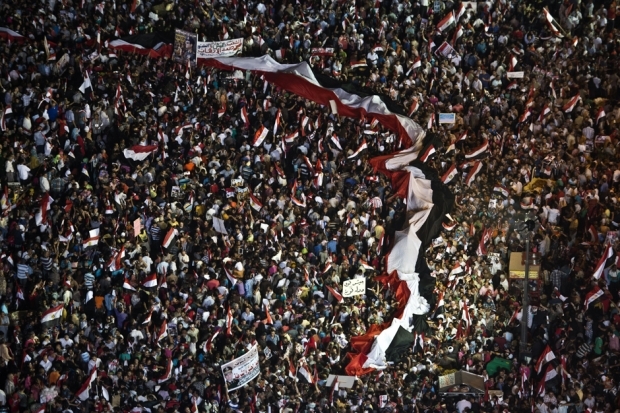 Supporters of Egyptian Armed Forces General Abdel Fattah al-Sisi wave national flags as they rally at Tahrir Square in Cairo on July 26, 2013. Photographs of the protests have been deleted from Chinese social media sites. By Lotus Yuen. This article was first published by Tea Leaf Nation. Recent months have been rocky for the Middle East: harsh crackdowns on protesters in Egypt and a Rashomon-like scenario in which the Syrian government and the rebels have accused each other of using chemical weapons, just to name a few. The region’s great distance from China has not diminished Chinese netizens’ interest in its unrest. That is not only because of the shocking death tolls, but also because recent riots on Egyptian streets and violence in Syria have resonated with incidents from China’s own history and a number of social changes currently taking place within the country. A week after Egypt’s deadly crackdown, the “specter of chemical weapons warfare” was seen in Syria, shocking the world as much as the violence in Egypt. According to Ban Ki-moon, the U.N. Secretary-General, the use of poison gas has led to over 1,400 deaths, with 5,000 people affected through contact with the chemical substance. Both catastrophes were covered substantially by Chinese media and at different times have become top trending topics on Sina Weibo, China’s Twitter. While the two events shared some similarities, as both involved needless civilian deaths and long-standing power struggles, Chinese netizens focused on different aspects of the two stories. In the case of Syria, where there has been more wrestling and negotiation between international powers, Chinese netizens analyzed the foreign policies of the United States, Russia, and China. China has long opposed international intervention in the Syrian conflict. Jokes like “Putin has betrayed President Xi?” and “It is quite difficult for China to play the role of the mistress” went viral when Russia and the United States announced a deal on Syria. On Youku, a popular YouTube-like video-sharing platform in China, a news video showed a young, unarmed person standing in front of a military tank to block its way has received over ten thousand views so far. While user @qjy1 left an oblique comment—“Similar things happen all the time, though they may end with different results,” other veiled remarks were more obvious, as with the comment “8964,” left by user @孤寂的枫, referencing the year, month, and date of the Tiananmen crackdown. Such vagueness is a must: words like “Tiananmen Massacre,” “Tiananmen Uprising,” and “June 4 incident” are sensitive words, meaning that posts discussing or even mentioning these phrases may be deleted, and in some cases those who post such content may be “invited to drink tea”—a euphemism for being summoned by Chinese authorities and told to stop posting such political content. In reaction to the tight censorship, Chinese netizens have developed a system of code words and oblique references to avoid filtration of their posts. When phrases as explicit as “Egypt’s Tiananmen Square” are eliminated from Sina Weibo, netizens again adopted the strategy of vagueness. The definition of the Tiananmen incident as a “massacre” resulted in a number of unwanted consequences for the Chinese government. Immediately after Chinese leader Deng Xiaoping ordered the People’s Liberation Army to disperse the protests, China was subject to widespread international condemnation, economic sanctions, and diplomatic isolation, arguably costing Beijing a chance to host the 2000 Summer Olympics. In contrast, while world leaders have roundly condemned Egypt’s generals, there has been no talk of punishment akin to China’s. Not all netizens clung to the past. Many instead regarded the situation in Egypt and in the Middle East at large as a reminder of existing social uncertainties in China. While sympathy for the civilians in the Middle East was prevalent in the Chinese online community, a number of netizens displayed relief that China does not have to deal with such instability. Some went even further, deeming the bloody violence a warning to those who have been calling for democracy and social changes. Public intellectuals explain constitutionalism—a word equivalent to universal values—as ‘rule of law’ so as to increase the legitimacy of this claim. But according to people like He Weifang [a well-known Chinese law professor], constitutionalism is the overthrowing of the socialist constitution and its replacement with a Western one that calls for ‘[changes in] party system, private ownership of land, independence of the judiciary, freedom of the press, and military neutrality. [The Communist Party currently controls the military. ]’ But look at Egypt! Hasn’t it showcased how ridiculous the constitutionalists’ appeals are? Some were far less strident than Wang, contending that it was not democracy that caused Egypt’s problems and the Middle East unrest in general, but an underdeveloped democracy. First, the interest group led by Assad maintains an authoritarian regime, incorporating the army into its own party and holding the bureaucratic regime tightly. Second, they deny constitutionalism, replacing rule of law with rule by power. Third, they carry out a bloody crackdown on civilians and dissidents. Fourth, national resources are exclusively owned by the Assad family, which has caused unfair distribution of benefits. Fifth, pro-Assad individuals are present at all levels of society, limiting people’s freedom of speech. Sixth, they control and suppress speech. [The situation of] North Korea tells us that a nation without reforms is a nation with no hope; Tunisia tells us that it’s dangerous to universally reject reform; Egypt tells us that when reform comes too late, it means tragedy for the country’s politicians; Syria tells us that a government refusing to adapt to the changes of the times means disaster for its people; Taiwan tells us that that timely reforms are beneficial to the government as well as to its people; Vietnam tells us that that gradual reforms can work.